1: In the beginning (2008) there was Dominion. And it was Good. 2: And there came upon the land Mike Elliot. He had designed such marvels as The Harry Potter CCG, Sword & Skull and Dreamblade. 3: And Mike Elliot gazed upon Dominion and saw it was Good. “But,” sayeth he, “The theme sucketh. I want me a deckbuilding dungeon crawl.” And so (2009) he brought forth Thunderstone. And it was Good. And many fans did gather to it. And many expansions did emanate from it. 4: But Mike Elliot was not happy with his creation. He thought it an abomination upon the land. So (2012) he brought forth Thunderstone Advance and made it backwards-incompatible with Thunderstone, thus destroying his initial creation. 6: And thusly did Thunderstone Advance gather many fans both old and new unto it, and many expansions did it in turn spawn. 7: But Mike Elliot was still not happy with his creation. He ached to wipe the slate clean and start again. 9: “Tell us more!” shouted the multitude. 12: And Mike Elliot looked upon the multitude, and smiled. I have no idea why I went all Biblical on you there, it just felt right. In fact, I was one of those fanboys who had all the expansions to the original Thunderstone and was mightily pissed off when Advance arrived–but bought it anyway. Then when Elliot announced Quest I got sucked in again. All I want is a good solid delving-themed deckbuilder, is that so wrong? Last year’s D&D-sanctioned Dragonfire is good. Mind you, it’s ten listed designers give me pause; games designed by committee are rarely successful, and frankly I don’t want to go down the rabbit-hole of “skimpy base-game followed by shelling out umpteen dollars for expansions that make the game actually good”. 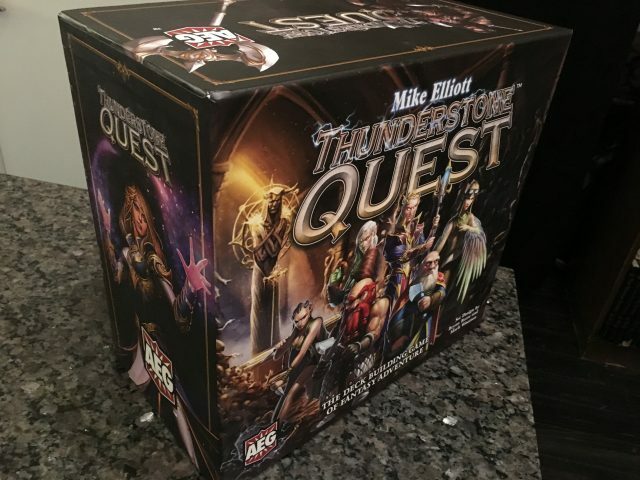 Thunderstone Quest offered a ton of content right out of the box, especially at the Champion level, and I was intrigued to see whether Elliot could reinvent the game yet again. This time around he was joined by Mark Wootton, a veteran of several Advance expansions as well as the overlooked-but-excelled Romance of the Nine Empires, and Bryan Reese, best known for his work on the L5R-themed boardgame War of Honour. My KS copy arrived a couple of weeks ago and I thought I’d give you a heads-up look of what you can expect when it hits stores. There’s no way I’ve had a chance to play through even a majority of the content, but I think I have enough to convey a taste of what this third iteration of Thunderstone is all about. The first thing to notice is that the box is YUUUUUGE, and solid. It has to be to hold all the cards. And if like me you bought the card sleeves add-on, you better save a season of something to binge-watch while you sleeve. 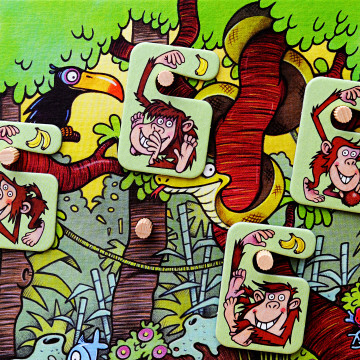 The Village now consists of various Locations on a board that your character can visit. You can visit the Bazaar to buy rations, lamps, and potions. You can go to the Temple to shed an extra wound and put some cards in your hand back on your draw deck for next turn (replacing the old “prepare” action). Or you can spend 10 gold in Diagon Alley (okay, not it’s real name) to buy a random treasure card, and some of them are pretty awesome if you luck out. Taking wounds now reduces your hand size. It’s easy to shed wounds in the Village, and some cards and classes leverage wounds in interesting ways. You can only buy one card in the Village each turn (there may be cards later on which allow for more buys; I haven’t opened all the packs yet). Combat is drastically improved and streamlined. 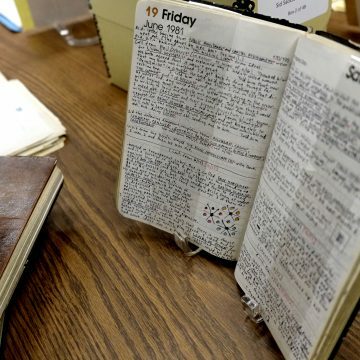 The myriad of phases and keywords have been reduced to a manageable and logical few. Light is now needed to move around the Dungeon, instead of for combat. No light, no move. The Guardian Boss automatically emerges when four Key cards are revealed from the various Dungeon Level decks. Each player gets a chance to amass a killer hand and whomp on the Boss, and essentially earns bonus VP for how awesome they are on that final turn. Final scoring is based on unspent XP, points on Item and Hero cards, the final round bonus mentioned above, and a secret Side Quest which each player selects at the beginning of the game. The sorts of irritations that use to arise in the first iterations of Thunderstone are gone. Monsters and wounds don’t clog up your decks any more. Well, there are festering wounds…but just avoid those, k? 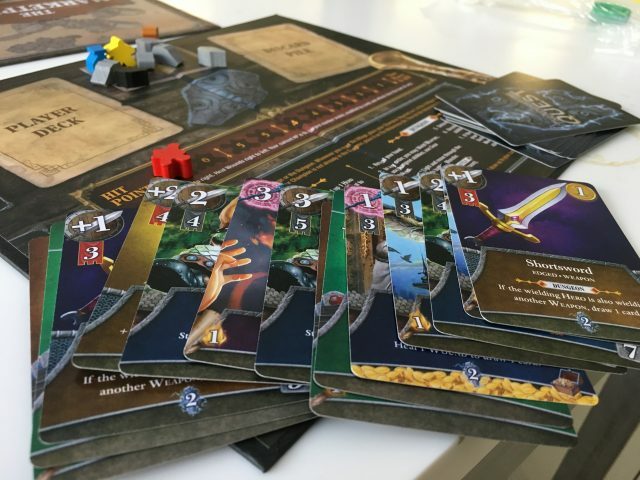 Level 0 Adventurers can level up more quickly, and the other starting deck cards are surprisingly useful deep into the game, making more for interesting decisions about how to tune your deck. Monster groups are levelled, so you don’t have those dead turns when no one can kill the demon-lich that’s hogging the Level One space and everyone spends turn after turn in the Village. The game comes with a Quest Book with lots of pre-fab scenarios you can play out, or you can randomize to your heart’s content. There’s also a Campaign variant which lets you carry forward cards from one play to the next, which is simple and elegant. The artwork is excellent throughout, but feel free to skip the scenario flavour text, which is amateurish (which is putting it kindly). But if you want something more story-based, you’re probably better off with something else–Dragonfire, perhaps, or the Pathfinder CG. 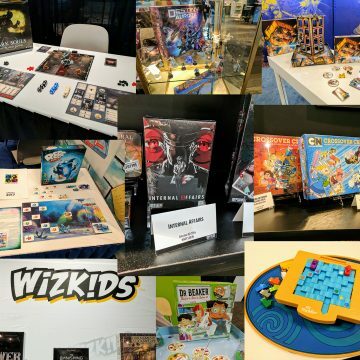 But truth be told, the true RPG/Deckbuilding hybrid has yet to appear, though there are various contenders in various stages of completion out there on BGG if you care to look. I’m also a huge fan of Aeon’s End, which is coop rather than competitive, but does a great job of feeling like a dungeon crawl, albeit without any spacial element. 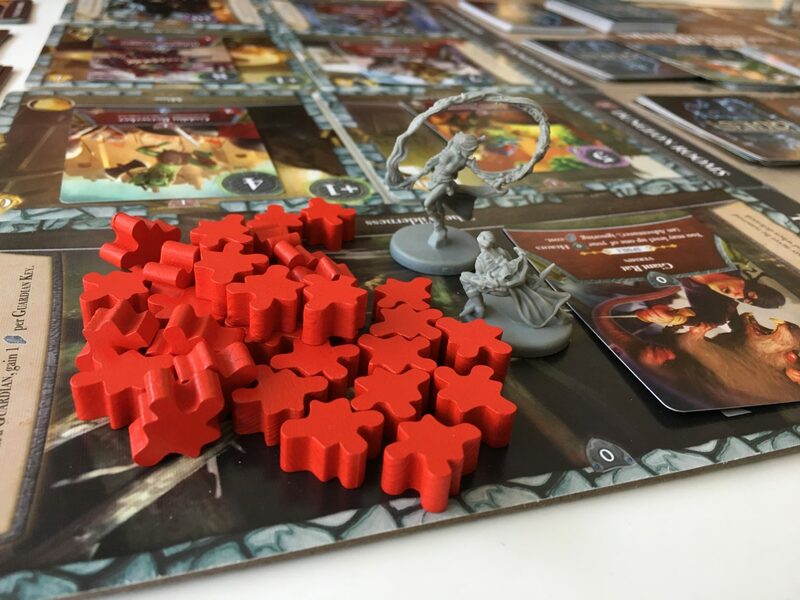 I did the original Thunderstone and liked it, but the expansions bloated it too much, and I’m not a big fan of new editions of high cost systems. Too many other good games out there that have already gone through Alpha and Beta testing without me paying for the privilege. Best intro to a review ever.